So, you’ve just rented a self-storage unit. You’ve packed up everything that you want to store and all that’s left to do is get it to your new unit. While it may be possible to fit smaller boxes and items in the family van, it may be difficult or nearly impossible if you need to move, say a dresser, a china cabinet, or a sofa. For larger or more cumbersome items, a larger vehicle will make transportation go more smoothly. Many self-storage renters opt to make the move with a U-Haul truck. As an authorized U-Haul truck rental location, Store It America offers a simple, convenient way to take care of the entire process. We offer U-Haul rentals at all of our Store It America locations, excluding Des Moines. Summer just began and we’re in the heart of boating season. Before you know it, though, summer will be over and you’ll want to have your boat prepared to keep in a safe place. It’s important to keep your boat in good condition all throughout the year—not just when you’re using it. There are a few important things to remember to do before you store your boat during the off-season. Take your boat out for one last ride. Chances are you’re going to want to do this anyway because you won’t want the season to end. On this trip out, though, make sure to pay attention to how your boat is riding. Make sure everything sounds good and you don’t notice anything funny going on. Letting issues sit over the winter will only make them worse. Clean your boat well. Your boat needs to be cleaned inside and out. This includes drain plugs and the engine all the way to the refrigerator or bathroom if you have one. Cleaning the important mechanics will keep your boat running well and is one of the most important parts to clean. You’ll want you boat to look nice as well, so clean off all the slime and dirt that is stuck on the exterior from the dirty river or lake. For your enjoyment on the first ride out of the season, clean the interior and make sure not to miss anything that can spoil in your refrigerator or onboard coolers. You’re going to be eager to take your boat out during the next season so get everything cleaned now so there’s no snags in your plan. Get your boat dry. You’ll want to make sure your boat is completely dry. Raise the bow and make sure all the water drains away from the boat. 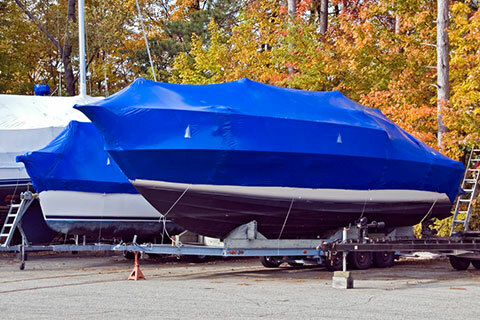 After you drain and dry your boat, you can also prevent mildew with cover bags on the interior. No one wants to come back to a smelly and mildew covered boat. Check all the fluids. You should check and change all the important fluids in your boat so you don’t come back to one that won’t start. Make sure to change out all the fluid or make sure it is at the correct level. Never drain the fluids from your vessel before you store it because this can create condensation and corrode your pipes. This includes topping off your gas tank so that it’s full, changing the oil, and checking the antifreeze. Keep your boat maintained over the winter. You should loosen or even remove your drive belts so they don’t crack under the extreme weather conditions during the winter. Lastly, you should grease all your controls up so you don’t come back to a boat you can’t steer because it hasn’t been moved all winter. Wax and cover your boat. It’s important to wax your boat before you store it to make sure rust or corrosion doesn’t occur. As an added bonus, your family and friends will be impressed on that first ride out when you take it right out of storage looking ready to go. Keep your boat in a safe space. You don’t want all the work you just did to go to waste. Keep your boat in a safe place so that weather or other people can’t get into it. If you follow all these steps, your boat will be ready to go next season. If you need a safe place to store your boat, Store It America has spaces that you can reserve early so you aren’t scrambling to find a spot. Contact us to get your spot reserved so you can enjoy the rest of the season with one less thing to worry about! Whether you’re a first-time RVer or a seasoned owner, storing your vehicle for the winter months is an important part of maintenance. Prepping for winter RV storage requires time, and there are several points to take into consideration before the cold hits. It’s more than just remembering to put antifreeze in your RV’s water system! When you start to work through your RV storage checklist, preparation procedures are divided into two sections: the coach and the chassis. 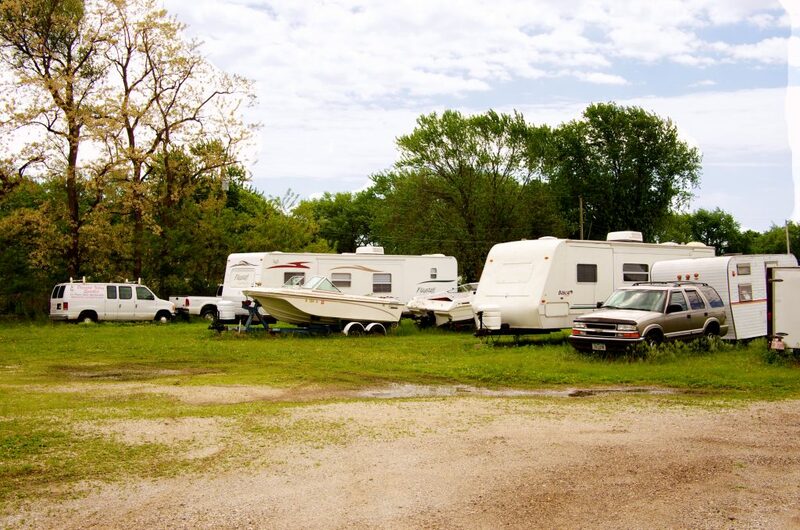 Be sure to avoid storing your RV near trees. It’s also best to avoid parking it on a grassy area. It is important to find a well-ventilated RV cover. This will help to prevent mildew buildup that can lead to mold. Make sure that your tires are inflated and covered. To avoid sun-bleaching on your furniture, be sure that all blinds and covers are down and securely in place throughout the winter months. This also helps to prevent rodents from taking shelter in your vehicle. Make sure that the main LPG supply valve is turned off. You’ll also want to cover any vents to prevent insects from finding their way inside. Be sure to remove any perishable items from the refrigerator, drawers, and cabinets. This is also a good time to defrost and clean your refrigerator. Bonus tip: Leaving some baking soda in the ridge with the door open will help to alleviate any odors that may occur during the winter months. Before storing your RV, you should be sure to change the oil. It is important to check the antifreeze levels in the radiator. The type of antifreeze for your vehicle can be found in your owner’s manual. You will need to store your RV’s battery separately to avoid any potential damage or drainage due to moisture or temperature drops. Bonus tip: When removing the battery, always take off the negative terminal first! While your vehicle is in storage, it is important that you add fuel stabilizer periodically. You will also want to run the engine on idle every two months for at least two hours to ensure that the fuel can circulate throughout the system. You should also do this for the generator. After all of the above is completed, you can be sure of a smooth transition back in the spring. Looking for a self-storage space for your RV this winter? We have spaces available at all of our locations. Click here to learn more!